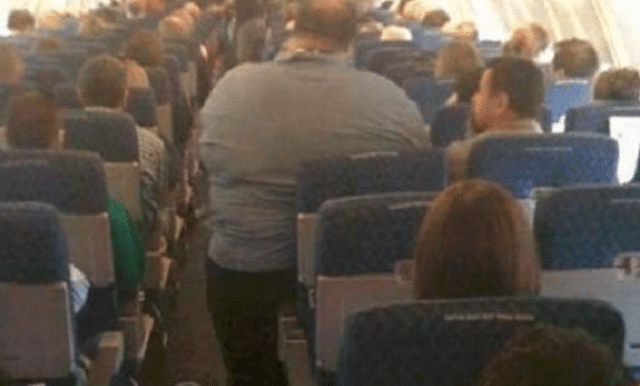 Michael Anthony Taylor sues American Airlines: Forced to sit next to two obese passengers 14 hours without respite. File photo (not actual incident). Michael Anthony Taylor sues American Airlines after sitting next to two obese passengers for 14 hours. A lawsuit that was inevitable. Michael Anthony Taylor a Wollongong, Australia man is seeking more than $100K damages from American Airlines after claiming suffering back injuries after being forced to endure sitting next to two obese passengers during a 14 hour flight from Sydney to Los Angeles. The suit comes after the desperate man had pleaded with airlines attendants (haven’t we all at some point of our flying careers…) to be moved to a different seat only to be refused. The man says the resulting discomfort led to aggravating an existing back problem. According to documents filed in court cited by the dailytelegraph, Taylor was seated next to the window in economy class on the December 2015 flight, sharing the row with two passengers described as ‘grossly obese’. Goes on to note the suit: ‘The body of the passenger next to Mr Taylor spilt over and encroached into his seat, forcing him to contort his body into a series of positions including standing up, crouching, keeling and leaning forward’. The situation caused Taylor to experience pain, injuries and discomfort during entire length of the flight which lasted 14 hours. The man said he has since suffered back injuries, neck pain and injuries, ongoing discomfort and the aggravation of pre-existing scoliosis — curvature of the spine. Mr Taylor’s lawyer, Thomas Jansen of Shine Lawyers, said his client repeatedly asked the cabin crew if he could move to another seat, but he wasn’t allowed. ‘Mr Taylor asked the cabin crew on numerous occasions if he could sit in another passenger’s seat, or sit on one of the crew seats, or sit in the aisle or even to sit on the toilet seat to alleviate the pain and discomfort that he was suffering from. One each occasion, he was refused and rebuffed,’ Mr Jansen said. In a bid to find some measure of recourse, Taylor was forced to crouch, kneel, brace and stand throughout the lengthy flight, which in turn only exacerbated his back injuries. The Australian traveler’s claim comes amid growing concern over airlines shrinking seats and cutting back on legroom in order to $$$$ cram more passengers onto flights. This week, American Airlines announced the legroom — or seat pitch — in economy on its new Boeing Max jetliners would shrink by up to five centimetres on three rows, allowing for 172 extra seats. A number of other airlines have been accused of the similar trend. The suit was probably inevitable given the ongoing demarcation between the have’s (who can afford to pay extra to be spared the ignominies of flying in today’s current landscape) and have nots (the rest of us who are forced to put up or with inconveniences that airliners have trained us to believe as the norm) and the increasing chasm that has resulted. Concerns over the ever-shrinking plane seat prompted a push last year to get the United States’ Federal Aviation Administration to set a minimum seat size and legroom requirements for airlines, which was rejected. Mr Jansen said as seats continue to shrink on planes, cases such as Mr Taylor’s are likely to become more common. ‘This will definitely become a more persistent issue,’ he said. Adding, ‘American Airlines has recently announced that they are removing up to two inches of leg room in some passenger seats in the Economy class cabin in their new passenger aircraft. The airline has 28-days to formally respond to the Statement of Claim filed in the Federal Court of Australia yesterday. What do you think? Will you be lining up to file suit as well …. ?